POWER PACKED course with expert David Tilney! Master Leasing is the most economical way to get into the real estate business today. It is also one of the most effective tools to use in protecting real estate assets. This course will show you how David has created various income streams by ‘borrowing’ other people’s real estate. It will also show you how Master Leasing can protect you against potentially ruinous ‘vicarious liability’ and ‘disparate impact’ claims. You will find that leases can transfer many of the benefits of property ownership without some of the liability. This material is not available anywhere else. It is offered infrequently and only to those who have first attended Hassle Free Property Management. Past attendees have used this material to successfully change careers and become real estate entrepreneurs without requiring any additional start-up capital. Master Leasing allows you to ‘test drive’ and control better rental properties than you may be able to purchase. Course workbook includes multiple samples of Master Leases, including a fixed lease, performance lease, pre-paid lease and multi-layered lease. David also provides a copy of the lease he used to tie up a property for 35 years on a fixed lease, along with the method he used to secure it to the property. Come explore this new world of investing where there is little competition and much opportunity! Regular price for all 3 power-packed days is $840.00 (including networking lunches). Register before 4/10/2019 to save $150 with Early Bird Pricing! More Info: Lodging, Lunches, Referrals, and More! 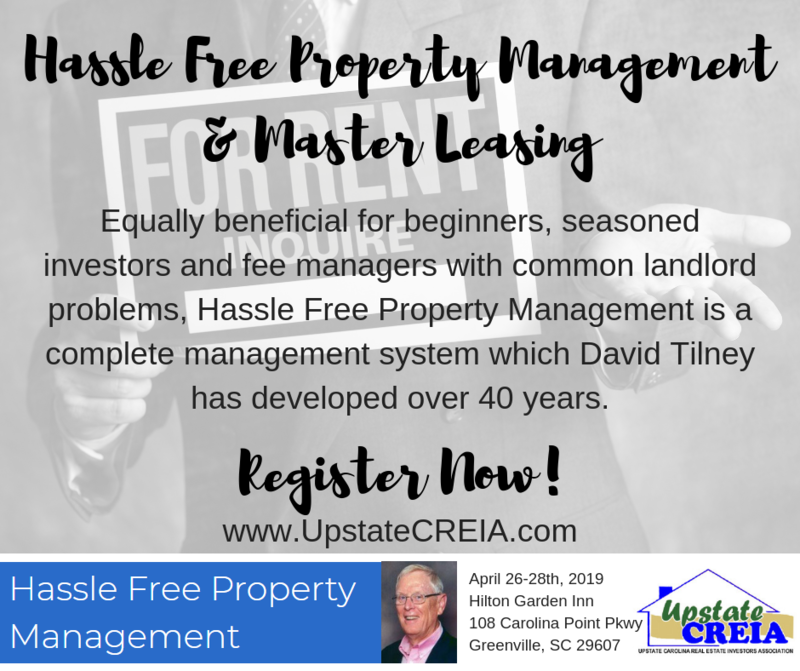 The Hassle Free Property Management Seminar weekend is being held at the Hilton Garden Inn in Greenville, SC. We have secured a room block at the rate of $109/night (includes hot breakfast! )...click the following link to reserve: http://group.hiltongardeninn.com/UpstateCREIA-DavidTilney Reservations must be made by April 12 to get this rate. Networking Lunches: included in your registration is an incredibly valuable daily networking lunch on-site at the Hilton Garden Inn. Meet with your fellow attendees, discuss the topics covered, and get to know investors and property owners from across the nation! 2 Day Registration: You may register for the 2-Day Hassle Free Property Management course alone without the Master Leasing Class. CLICK HERE for more information.